In the spring of 2012, community business leaders and the Ellsworth Area Chamber of Commerce Board of Directors emphasized the importance of beautifying our community in celebration of Ellsworth’s Sesquicentennial. With their motto of “Building a Better Community” in mind, The Ellsworth Chamber of Commerce reached out to local company Fairmount Minerals for funding. The company responded with a generous grant to implement a Flower Basket Program in the Ellsworth Community. Additional support from many other local businesses followed. 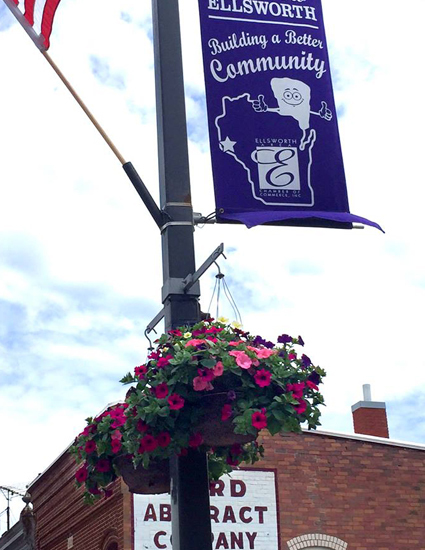 In addition to the twenty stone planters already located around town, 26 hanging baskets were installed along Main Street, with a goal is to increase this number in the future and extend placement beyond Main Street. By the fall of 2012, when the hanging baskets were coming down, another source of community pride was undergoing its own beautification: East End Park. As the crowning achievement of the Sesquicentennial Committee, major improvements were made in honor of Ellsworth’s 150-year history – fitting for a park celebrating its 100th anniversary in 2012. Over one hundred residents and businesses contributed to the final effort, which included the addition of concrete planters, an iron fence, stairs, light poles, and park sign. Since that time, the Ellsworth Area Chamber of Commerce has overseen maintenance of these projects, as well as financed additional beautification efforts, including the renovation of the bathrooms in East End Park. Our Beautification Program adds beauty to our community, and is a source of pride for our village’s residents and businesses. Today the effort not only includes the planters and hanging baskets, but the decorating of East End Park for Christmas, as well. Supplies and maintenance costs for these efforts are expensive and the costs continue to rise each year, yet we remain dedicated to continuing the beautification effort. To ensure financial resources are available to continue the tradition and funding of the Beautification Program into the future, the Chamber oversees an ongoing fundraising effort. Thanks to the financial contributions of many local businesses, civic groups and charitable organizations, and the dedication and support of many volunteers, and current and past residents of the community, a general beautification fund was established to help in financing the ongoing maintenance of current planters and seasonal decorations, as well as provide for new beautification projects to enhance our community in the future.